A BLOG FOR FAMILIES WITH THINGS TO DO AND MOUTHS TO FEED! I'm always excited when new journeys come my way, and I'm ESPECIALLY excited about the Saucy Mama recipe contest this year! I'll be sharing my journey with all of you right up until the end, so stay saucy and stay tuned! About Saucy Mama: Saucy Mama is the "signature brand" of Barhyte Specialty Foods, located in Pendleton, Oregon. They take GREAT pride in using only the best ingredients and creating "some of the most delicious mustards, marinades, wing sauces, and other gourmet condiments!" They're a family company using recipes that have been handed down from prior generations and have earned an eager and loyal following all across North America. My favorite part about Saucy Mama? They pack TONS of flavor into simple sauces and don't incorporate lots of extra sugars, salts, preservatives and additives. Saucy Mama's sauces are ALL NATURAL! So pour, dip, marinate, and slather away...guilt free !!! 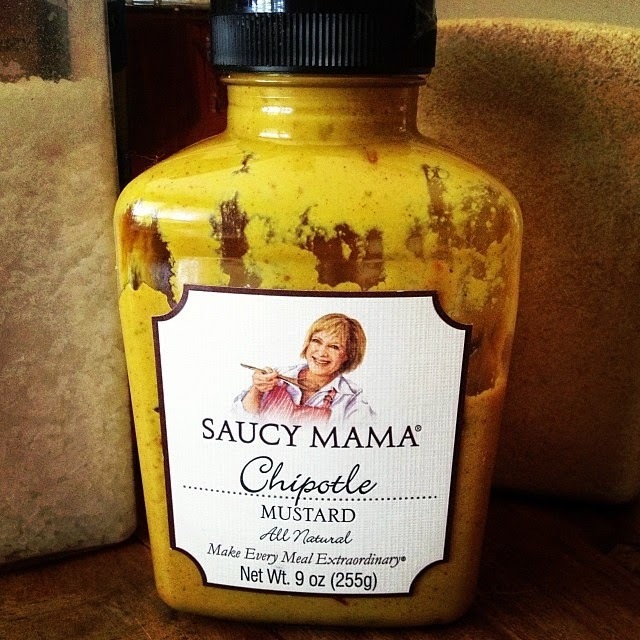 Saucy Mama's Chipotle Mustard - YUM !! Saucy Mama is choosing ONE blogger to compete under her belt for the title this year. They'll send that person to compete in the category under which they qualified their recipe (burger, sandwich, bacon, seafood, pasta or cheese). The winner will not only get a "golden ticket" to the WFC, but will also get $1000 in prize money and $1000 in paid travel expenses to cover the cost of getting to Vegas, baby! I call that a PLATINUM TICKET !!!! Mommy likey... MOMMY WANT. I'll be receiving my kit of Saucy Mama products in the mail VERY SOON, and I'll be sure to share which one(s) will be going into my SUPAH DUPAH entry into the Saucy Mama recipe contest in hopes of getting BACK to the WFC for some RECIPE REDEMPTION !!!! So, until the day arrives when the mailman brings me some saucy presents, I'll give you a little treat. Saucy Mama has a DELICIOUS Chipotle Mustard, that's super saucy on its own, but I added a few little extra ingredients to turn this into the PERFECT, fat-free, dairy-free, low-glycemic salad dressing !!!! I tossed this in with my Southwest Sausage and Kale Salad and it was a luscious lunchy munchy !!! Heat a large skillet to medium heat. Remove the sausages from their casings (if they have them) and add them to the pan. Stir and chop with a spatula as you cook, about 7-10 minutes until the sausage is cooked through. Remove from heat and allow to cool while you make the salad. Chop the tomato, scallions, cilantro, kale and lettuce. Add them to a large serving dish or bowl. Add the black beans, corn and cooked sausage. Toss all the ingredients together until combined. Add the dressing and toss, or serve it on the side! Combine all ingredients in a medium mixing bowl and whisk until combined. Toss in with your favorite salad or enjoy as a dip for fresh veggies and chips! Healthy Product Review: Pesticide Free Produce with Eat Cleaner! Award-winning Food Competitor and Healthy, Busy Mom! I enjoy healthy every-day recipes and the occasional mega-calorie splurge. I love food styling and photography. I share photos, recipes and products that I love! Awesome Inc. theme. Theme images by MvH. Powered by Blogger.